Submitted by Susan Miller on Sun, 06/24/2007 - 12:03. I wonder if golf courses are still using gallons of herbicide, pesticide and fertilizers (the stuff that encourages the algal blooms in our Doan Brook for example). I wonder if this would be so for the proposed golf course slated for the lakefront in the City of Cleveland's Lakefront plan. The issue has been studied and addressed by OSU Extension. So who among us knows what is going on at our local golf courses? Are errant golf balls breaking windows? Are leaching chemicals entering our waterways? Are these urban wildlife corridors providing habitat for wildlife or killing them? It is easy to see in the attached google earth snapshot, how crucial these golf courses are as wildlife corridors. Are they with the program of greening our region? If not, how do we encourage them to get on board? Submitted by lmcshane on Mon, 06/25/2007 - 09:16. Boy Susan. You sure know how to rake muck! (and I am glad for it) Golf courses have traditionally been land holding tanks for developers. Look at the history of your own Cleveland Heights Euclid Golf Allotment for the methods to the madness. If my memory serves me correctly, Fred Rzepka (Cleveland Metroparks board president for LIFE (?!) is one of the owners of the private Hawthorne Golf Course. And a big YES to your suggestion to secure conservation easements on these courses. Call Western Reserve Land Conservancy. Is this a push for them? If not, how can we protect these spaces? Little groups like West Creek Preservation Committee can not do it by themselves. Submitted by Susan Miller on Thu, 07/05/2007 - 10:45. Regarding golf: A golf course that meets certain environmental standards may be certified and designated as an "Audubon Cooperative Sanctuary". Locally, the Washington Golf Learning Center in the Cuyahoga Valley has just received said designation. So, we ought to indeed encourage existing courses to meet these standards (which include, but are not limited to the standards set by the OSU Extension. And, when the useful life of the golf course is over, WRLC or some other entity ought to preserve (and preferably restore) the land as greenspace. Does anyone reading this play or belong to a golf club? Please feel free to forward this to your golf club. They could improve our environment, their image and their bottom line. Washington Golf Learning can surely walk them through the process. Submitted by lmcshane on Thu, 07/05/2007 - 12:05. Susan, Please ask Chris to clarify on the amount of park land added in Cuyahoga County. George Nemeth at BFD raised the question in response to this blog at Crain's Cleveland. I can't really answer the question, but I tried. Some might be surprised to know that Mittal Steel donated some of the reclaimed land in Washington Park. I am glad to learn that Washington Park is not managed in the toxic tradition of most golf courses. When I lived in New York, in the Finger Lakes region, I remember reading about a high incidence of brain cancer mortality in golf course managers. The lakes and water bodies in New York don't have a great buffering capacity, because of the granite bedrock--nonetheless, run-off in Ohio should also be figured into calculating community risk with the use of pesticides/herbicides. Remember Acid Rain? Submitted by Susan Miller on Fri, 02/22/2008 - 10:21. More Americans Are Giving Up Golf is in the NYTimes. "In many parts of the country, high expectations for a golf bonanza paralleling baby boomer retirements led to what is now considered a vast overbuilding of golf courses. Between 1990 and 2003, developers built more than 3,000 new golf courses in the United States, bringing the total to about 16,000. Several hundred have closed in the last few years, most of them in Arizona, Florida, Michigan and South Carolina, according to the foundation." So what are the options for these large landowners if the trend continues? Well they can always become parks, donating the land back to the cities, counties and states in which they have been built. They could get into the business of green burials. I can see it now, "Golf goes back to nature".Golf may be waning in popularity, but death - now that's something we can count on. Just ask a funeral director. Submitted by metroparks muse on Sat, 04/26/2008 - 17:52. On the subject of golf: Cleveland Metroparks Board meeting Thursday included a presentation on plans "To keep golf vibrant and contemporary..." Nationally the sport has been in decline for a number of years as noted above and golfers are less than 2% of all recreation visits to CMP. Nonetheless, Metroparks financial support of golf increases every year. This planned promotion relies on information from the National Golf Foundation (CMP's annual membership about $1000) which has "long has endured critics challenges about the accuracy of its data - no minor issue considering ... Its for-profit services already account for approximately 50 percent of NGF's total revenues..."
Other CMP programs involved in promoting the sport include The First Tee at Washington Golf Course where 3/4 of a community park was turned into a golf course. Rounds there were projected at 31,000/yr but totaled only 13,000 in '07; so taxpayers chipped into to the tune of $296,000 or $228/round. So we are pouring public money into supporting a struggling sport, but not because of public demand. Perhaps it is because all three Commissioners are golfers, including Fred Rzepka who owns Hawthorne Valley Country Club. Due to lagging membership he has threatened the City of Solon with developing the course. Moreover, environmental claims (including awards from Audubon International - which is not related to National Audubon Society) are mere greenwashing, in my (and others') opinion. Really 'green' golf courses require changing our expectation for perfect turf, an issue Metroparks has not even considered. rzepka and Transcon developing the metropark with new urbanism? Submitted by Susan Miller on Sat, 04/26/2008 - 20:30. I searched Rzepka and found this charming tidbit from Linda Sekura from the Sierra Club. It is always interesting to me what pops up when one perfoms a google search. What the hey!!! We have a developer golfer at the helm of our beautiful Clevelkand Metroparks!?! Is William Stinchcomb spinning in his grave? The Musical Arts Association plans to sell hundreds of acres of land around Blossom Music Center, and Brandywine Golf Course was for sale - but apparently it isn't... (you have to have a login and password to access this article). What's going on in our parks? Is this a sleight of hand deal where we focus on downtwon and vote in those metroparks levies whenever they come up only to have some ruse foisted upon us while we are not looking? Are these "green" golf courses or landbanks for developers or are they the same old same old chemicalized supporter's of Marysville's Scotts or Tru (false)Green Chemlawn courses? Submitted by lmcshane on Sun, 04/27/2008 - 08:28. I meant to say Rzepka owns Hawthorne Valley Country Club which straddles Tinker's Creek before it enters the Bedford Reservation. Tinker's Creek is 96 miles long, just short of USGS classification as a river. At one time, engineers wanted to dam the scenic gorge you see of it in Bedford Reservation. If you haven't seen the Bedford Gorge, see it sometime this summer, or especially in the fall. It is like a mini-grand canyon. Here's the article you refer to Susan. Cleveland Public Library provides access to the Akron Beacon Journal, which is listed under Newsbank Newspapers. When, I worked at the Metroparks, I spent a greater part of my time on the inventory of open-space in Cuyahoga County. When I saw the country club, owned by Rzepka, and other large land parcels in the Chagrin River watershed, owned by past Metroparks trustees, I could not believe it. Why would these men NOT will their estates to the Metroparks? Well, we now know the answer to that question, don't we folks? how many acres of golf? Submitted by Susan Miller on Sun, 04/27/2008 - 10:54. I appreciate the metroparks trails and natural areas. Because I live in Cleveland Heights, one of my favorite walks is along the Chagrin River just south of South Woodland Road toward Jackson Road. I see on the CMP site that the Metroparks offers "hundreds of miles of hiking trails cross the more than 20,000 acres of Cleveland Metroparks". How many acres of our Metroparks are golf courses? Does anyone know. I am not a golfer, so I would never visit a golf course, but it seems to me that there is a wonderful opportunity here to model the behavior on herbicide, and pesticide bans to protect our watersheds and wildlife habitats. 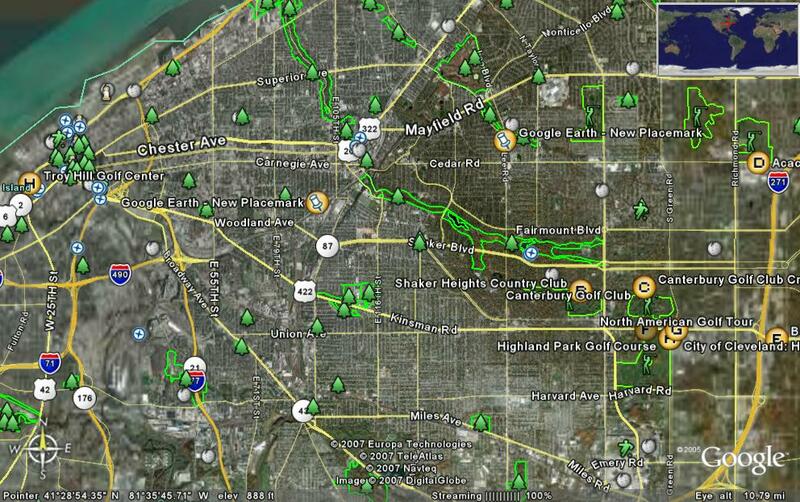 How big could this be if the Metroparks led the way with this sort of effort? Submitted by lmcshane on Sun, 04/27/2008 - 16:21. Susan, I am not anti-golf, but I am against park uses that don't pay their way or have a history of not paying their way for the damage they inflict on the environment...say mountain bikes. I am going to get some angry noise, but golf, horseback-riding--somewhat elitist past times-- have traditionally paid their own way and in the case of the bridle trails, helped to establish some of the park land. Golf is probably losing money now, but at one time it was a money-maker. Active sports, in general, have seen a major decline and we are in danger of producing a fat cohort of kids with low bone densities and high blood sugar. The Metroparks is definitely an asset that can help address this epidemic of obesity. As residents, we need to keep an eye on them and demand services that strike a balance between protecting nature and making it accessible to residents. The Metroparks can not be expected to be all things to all people. Some uses are compatible, some are not. Perhaps, the time has come to phase out some golf courses for passive recreation, wildlife protection and, significantly, the protection of our Cuyahoga River and Lake Erie watershed. Every acre we allow to revert to natural habitat, filters and protects our vital Lake Erie watershed and lessens the potential for catastrophic flooding. Downstream communities should be willing to pay for this protection. Submitted by metroparks muse on Sun, 04/27/2008 - 21:35. Cleveland Metroparks likes to state that they maintain a 20/80 "balance" between developed and undeveloped areas. In Rocky River Reservation (the most visited), a 1996 breakdown shows 25% developed with 37% of those developed acres for golf. In other words, 10% of that reservation was devoted to golf. It must be more now since they took over the site of the old maintenance building. A gigundous new complex, including golf offices, was built on "vacant...underutilized" land across the street. (Commissioner Rzepka's description at the ribbon cutting.) Footprint at that site alone is 7A. Of course, except during the off season, golf courses are only for golfers: Washington Park posts signs saying paths are only for golfers, not to speak of the course itself. Most park areas are shared. On the other hand, errant balls may whip past users of the All Purpose Trails where they run alongside courses. Shawnee is half of Bedford's developed acreage, Sleepy Hollow is 30% of Brecksville's and Manikiki itself is 192 acres while the remainder of N Chagrin has only 140 developed acres. Rough total is 625 plus acres devoted to golf. A lot of land to keep watered and mowed and sprayed with chemicals. As far as revenues, golf hasn't turned a profit since 2000, and hasn't even had an operating profit since '04. Losses from '01 through '07 total about $9.7 million. Metroparks officials maintain that all users are subsidized to some extent, but golf serves a tiny group, competes with outside private tax-paying enterprise, and gobbles up way more than its share. For exercise, walking (on trails which cry out for attention) is far better. Golf cart rentals -which contribute 20% of income- are also encouraged because they speed play. Yet, "As David Fay of the USGA has written, "We strongly believe that walking is the most enjoyable way to play golf and that the use of carts is detrimental to the game. This negative trend needs to be stopped now before it becomes accepted that riding in a cart is the way to play golf." Walking a golf course is good for your health, good for the course's health and good for the game's health." Recruiting juniors is part of golf's efforts to increase numbers. CMP did a last minute budget addition of $50,000 to look into turning one of Rocky River's underperforming courses into another junior facility. But restoring it to a natural state would be a better choice. Submitted by lmcshane on Mon, 04/28/2008 - 08:57. Restoring the Metroparks to a natural state would be my preference, too, but when I worked at the Metroparks and the planning department wrestled and struggled over providing for active sports and passive sports, fortunately (in my opinion), passive usually won. The Metroparks also struggled with ADA accessibility issues and providing paved trails for wheelchairs has often met with criticism from residents. In the nineties, archery, model airplane enthusiasts, basketball, equestrians, roller bladers, rock climbers, touring cyclists, tennis, dog walkers, skate boarders, campers, and, mountain bike enthusiasts, all petitioned for a piece of the Metroparks pie, Vern Hartenburg was recruited from a park system that built huge outdoor theme playgrounds, so I didn't expect the bird watchers of the world to win. Also, municipal recreation centers were (rightly) expected to provide for these physical outlets. I was pleasantly surprised to see that given all the pressure to turn the Metroparks into an active playland, it didn't happen. But now, we desperately need to encourage outdoor recreation. I would even suggest turning over a section of the Metroparks to mountain bikes...this era's new rough riders, if they paid for the experience (preferably by buying land to add to the Metroparks--the Big Creek valley between the Metroparks Zoo and the Towpath, comes to mind). We have seen a horrible decline in outdoor recreation. And, I can't tear kids away from the computer screen, even on a sunny day. So, now what? Submitted by lmcshane on Mon, 08/18/2008 - 21:01. Acacia golf course is on the chopping block. Would the County and Cleveland Metroparks even try to protect downstream residents in the Euclid Creek watershed from further degradation and flooding by acquiring the property? Submitted by Susan Miller on Mon, 08/18/2008 - 22:18. I wonder if Acacia has considered a conservation easement. I wonder if Elaine Price formerly of the Holden Arboretum, now county green print driver is in there swinging for the county green print. How about using it for growing food? Can we do the calculations for turning it into agricultural land? Submitted by metroparks muse on Mon, 08/18/2008 - 22:44. As a fellow golf course owner (Hawthorne Valley Country Club) seeking to develop his own land, CMP Commissioner Rzepka would not likely compete to protect land. In fact, in spite of losing once in court, he still has two separate lawsuits underway seeking to overturn the will of the citizens of Solon (who twice voted down rezoning his land). And that is land adjoining existing Metroparks' South Chagrin property which would also serve as a driveway for his development. As far as the sinking fortunes of golf: CMP recently purchased new patio furniture for Manikiki. Reminds one of rearranging deck chairs on the Titanic. Submitted by Susan Miller on Tue, 08/19/2008 - 10:15. Take a hint from Holden Arboretum - buy now and CONSERVE, CONSERVE, CONSERVE. Submitted by Susan Miller on Mon, 08/25/2008 - 19:09. "StoneWater Golf Club in Highland Heights has changed hands for $4.2 million, according to property records. Water Golf Ltd., a partnership involving Cleveland investor Steven Calabrese, bought the 18-hole course from Aberdeen LLC, led by James Skoch. The deal closed Aug. 15. StoneWater adjoins the Aberdeen residential community, east of Bishop Road and Aberdeen Boulevard. Calabrese and business partners also own and run Little Mountain Country Club in Concord and Cumberland Trail Golf Club in Pataskala, near Columbus." From their website which invites you to "walk" their course, "Walking is permitted anytime during the Off Season and after 6 PM during the Summer Season. Pull carts are prohibited." I don't suspect I'll be walking there anytime soon. Submitted by lmcshane on Wed, 11/14/2012 - 10:18. Submitted by lmcshane on Mon, 08/18/2008 - 20:01. Thank you to the Conservation Fund in Virginia for brokering this deal and thank you to the current board of the Cleveland Metroparks for finalizing it.